Located in Francestown, the original Crotched Mountain operated for a quarter of a century. Also known as Crotched East, the original ski area remained inactive when Crotched West reopened in 2003. There are no plans to reopen Crotched East. 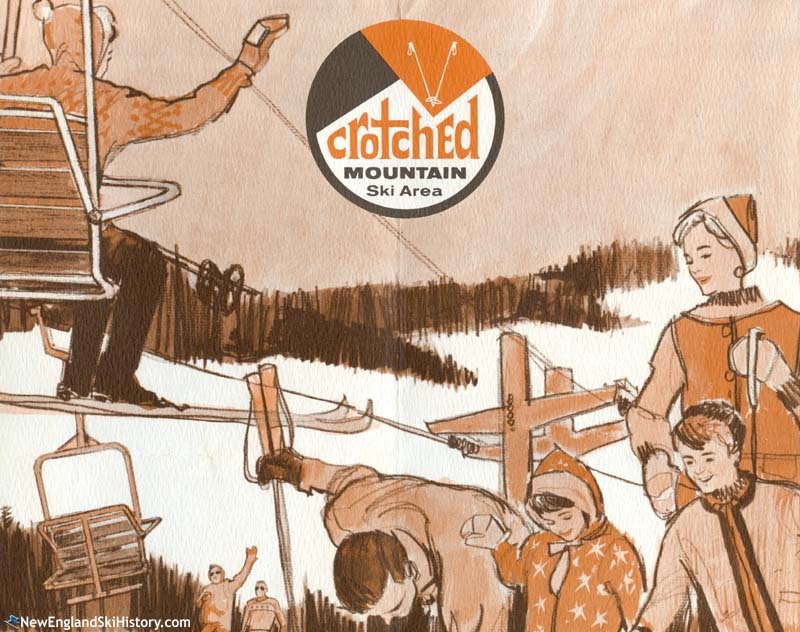 The original Crotched Mountain ski area was developed to specialize in serving handicapped children and adults - a fitting mission, considering its proximity to the Crotched Mountain Rehabilitation Center. Announced as early as 1961, development didn't commence until 1963. The Eastern Ski Area Operators Association helped to raise funds for the development, including a massive fundraising day at many ski areas on March 17, 1963. The area was designed by Everett Lord-Wood and cleared by Ray Parker. The $750,000 Crotched Mountain facility opened on January 4, 1964 with a T-Bar and makeshift base operation. The double chairlift would open later that season. A new base lodge opened for the 1964-65 season, though unfortunately it was not enough to lift business during a rough winter. Instead, Crotched's income may have dropped as much as 50%. The 1969-70 season was another tough one for Crotched, as revenue declined in large part due to poor weather. In addition, a new area named Onset opened just west of Crotched, featuring a bubble double chairlift, a regular double chairlift, and a T-Bar. Circa 1971-72, a beginner surface lift was installed on lower Easy Street, called Grandmothers Lift. 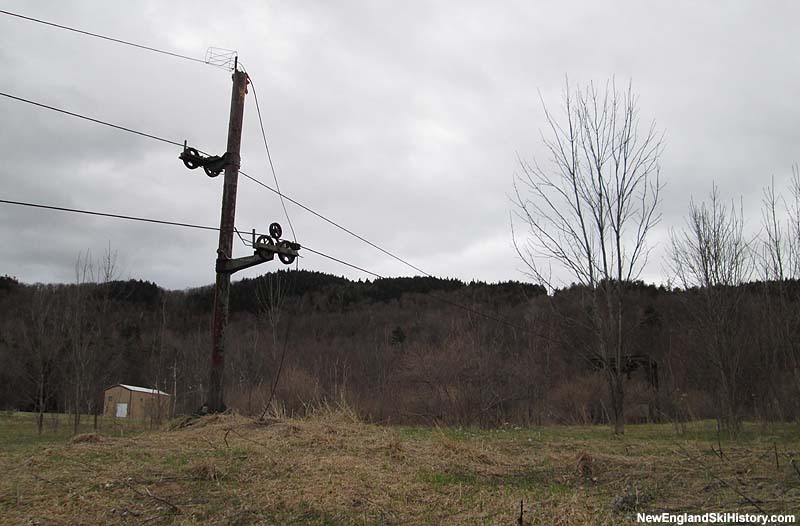 In addition, the chairlift line may have become an official trail. Gannett Management Company took over Crotched in 1974, dropping rates and cutting a new trail. Soon thereafter, a reciprocal lift ticket between Crotched and Onset was made available. Under new management in 1977, adjacent Onset ski area became Bobcat. Financial woes continued, resulting in Bobcat being sold at auction to group of investors including Waterville Valley's Tom Corcoran for $222,000 on September 14, 1979. Corcoran and Crotched's Tim Gannett then formed a management company to operate both areas as one. The areas were likely joined by two novice connecting trails for the 1980-81 season, giving Crotched the marketing tagline of being Southern New Hampshire's largest ski area. In 2003, Peak Resorts reopened the Onset/Bobcat/Crotched West area, naming it Crotched Mountain. In the meantine, the upper mountain lifts at the original Crotched Mountain were removed. It is unlikely that it will ever reopen. "I have had several memories of Crotched. I first skied at Crotched East in about '85 or '86. I recall better skiers "going to the West side". Those lifts were high off the mountain surface. I later drove a school bus in Milford to the Rehab Center. Today, I drove up there and hiked along the Gregg Trail. Later, I drove toward the West Side and got on Mountain Road (before West side base), thinking that is where the base of the original Crotched that I skied was. (Ross Budd, is that where the "East side" condos are? )I even drove on Onset Road, where I saw condos. 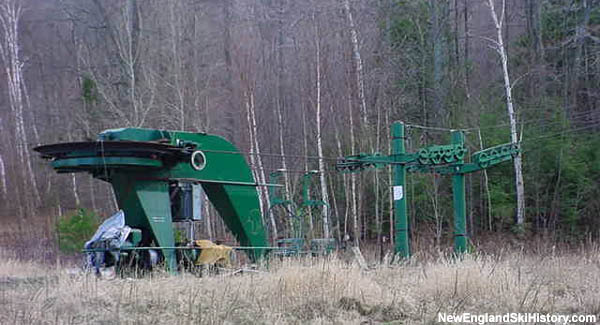 I have seen photos of the chair lifts and T-lifts on that side, but they don't seem visible. I know it's been an eternity. So, I have some questions. 1. Where, if at all, can I get closest access to where the parking lot of the East side was? I know Francestown owns it, but I'd love to see at least roughly where it was. What street would I get on? 2. Does a trail begin there to the Summit? 3. When you're at the end of Gregg Trail, where are you relative to the "East" and "West" sides? 4. Can you see any of this on Google satellite? I appreciate sincerely anyone's help in my trip down Memory Lane." "I moved to NH the summer of 82. I remember that first winter skiing at Big Bear, Temple and Crotched. What sticks in memory the most was the Ski lodge at crotched. There was a lot of fun apre ski to be had there. I had a season pass from 82 till they closed in 89. Ironically 28 yrs laters I'm living in a Condo on the East Side of Crotched." "I won a GS at Crotched Mtn. circa late 60's. I can't remember why we were racing there but I do remember winning the race. I can't imagine that there are any records still around from that far back." "Crotched Mt has a few firsts for me. I learned to ski there when it opened ... how I hated the T-bar and couldn't wait to ski well enough to use the chair! After college it was my first real job eventually managing the inside operations. I remember the blizzard of 78 coming to work and a full parking lot of skiers that didn't want to get trapped under the state of emergency in MA. Also made great friends with the owners of The Inn at Crotched Mountain...John and Rose Perry are great people!" "I remember attending Sise Cup Masters GS races at Crotched West in the '80's...and have recollection of skiing over to Crotched East and back. Could that have happened in the '87/'88 season? Either way the GS hill was fun, I remember being able to watch the race from the chair on the way to the start." "I was hired as the Skier Services Manager for the 88/89 year. The task was to attempt to find a way to stop the bleeding and turn them toward a profit making enterprise. It didn't take long to find that the financial issues were self induced and pushing the legal boundaries. I left that summer. Sad really. It should have been angoing concern as a local feeder ski area."